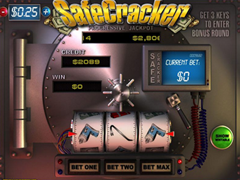 Safe Cracker Pokie Review - Play Today! 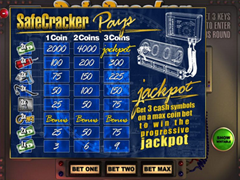 A 3 reel slot with a progressive jackpot from Playtech, SafeCracker has an unusual looking design and it uses 1 payline. It gives up the usual classic design of the slot and manages to integrate the reels of the slot into an actual safe, using elements from the betting system to enhance the look of the vault or to simulate the tools that are used in order to break into it. The game’s design is certainly worth a bit of attention on the player’s part, especially since the developers went to so much trouble to integrate it into the theme. As many classic slots do, this one also doesn’t offer any additional features. The SafeCracker theme gives us a chance to be part of the breaking into a safe. The entire game is designed to look like it’s being used for the break in. The reels are connected with wires to the Bet buttons, while the buttons are connected to a display that shows the Current Bet. It looks like the reels are trying out combinations of symbols, in the process of guessing the password that will let the player inside the vault. It’s all very well done, with the background image being part of the game since the reels are connected with it, the image of the big bank vault. The list of symbols is made up of dollar banknotes, sticks of dynamite, drills, crowbars, locks and keys. There are two major features that provide a change of pace to the game, but one of them is extremely rare. I’m talking about the progressive jackpot, of course, a prize that is offered only to the players that use the maximum bet and at the same time manage to get a combo of three cash symbols on a line. The second feature is a bit more common, the bonus game that you can trigger with the help of the key symbols. You need the three symbols on the payline to be composed of three keys in order to get in. When this happens, the door of the safe opens and you get a choice, having to pick from among the ten safety deposit boxes that are inside. You will find that three of them have alarms set up, while seven have prizes. The game ends once you hit one of the alarms. SafeCracker is an unusual slot machine, but it’s a good thing in this case. You will find an interesting idea inside, which was properly put into practice and it makes for a decent game.